“As his speech deteriorated, Hawking learned to make every sentence count” (597) wrote theoretical physicist Kip Thorne. A complete history of speech synthesis and semiotic systems has yet to be written. I formulated the following reflection before news broke of Stephen Hawking’s death this week. Plato was suspicious of signs (or names). He said about things that exist “it is far better to investigate them and learn about them through themselves than to do so through their names” (154). Aristotle, the Stoics, and the Epicureans continued to debate the role of signs in the relationship between the human and the world. According to Winfried Nöth’s Handbook of Semiotics, the first mention of semiotics as a study in philosophy came with John Locke’s (1632-1704) Essay Concerning Human Understanding, in which Locke outlines a doctrine of signs. Things in themselves are not present to the mind for contemplation unless we use signs: “to communicate our thoughts to one another, as well as record them for our own use, signs of our ideas are also necessary” (443). Locke thought “ideas and words” are “the great instruments of knowledge” (443). According to Nöth it was the mathematicians Johann Heinrich Lambert (1728-1777) and Bernard Bolzano (1781-1848) who gave the theory of signs a systematic treatment. The first heavy duty exponent of a theory of signs was of course C.S. Peirce. I have found mention of Lambert in Peirce’s writing, but not Bolzano. As a learned philosopher, Peirce drew on the legacies of Kant, Hegel, the Romantics, Locke, Darwin and an impressive array of sources throughout his career. There’s no question that Peirce was familiar with traditions of thinking about the sign, as well as the many other themes he addressed. As I am considering the history of sign scholarship, it’s worth considering how scholars have used the idea of the sign to structure social history. The social philosopher Michel Foucault (1926-1984) developed such a sign-oriented history. Foucault’s book, The Order of Things (Les Mots et les Choses, i.e. Words and Things) is substantial. My edition has 387 pages, in small font, with endnotes to each chapter, and no bibliography or index! Thankfully, Winfried Nöth provides a helpful summary in The Handbook of Semiotics (305), as do some interesting websites. The pre-classical period, including the Middle Ages and Renaissance, was governed by resemblance. Look for what is similar between things, whether causal, systemic or accidental, and group them together. This is also about the relationship between words and things. The Enlightenment — he (confusingly) calls this the Classical Period, characterised by ordering and classification. This included reference to an exterior world. Later, scholars abandoned this reference to an external world. Signs involve the reference of one idea to another. The modern period includes the last two centuries. The nineteenth-twentieth century is characterised by a reflection on language. We do not just use language, nor are we in it, but can objectify and study language critically, including its history and evolution. Human kind is emancipated, freed, from the constraints of language by virtue of the conceit that we can study it. Foucault subsumes notions of triadic and dyadic theories of the sign in this account. A triadic theory tells us that a particular sign (the word “tree”) refers not just to an idea, but to an actual thing in the world (word-concept-thing). Peirce’s view and that of his followers supports such a view (see triadomania post). A dyadic view is that signs refer only to other signs (or ideas) in a self-referential language system (signifier-signified). Without referencing Peirce, Foucault writes about a transition from a triadic concept of the sign to a dyadic concept. According to Foucault, Saussure “was in fact rediscovering the Classical condition for conceiving of the binary nature of the sign” (67). I think here, Foucault is assuming the dominance of Saussure’s structuralist semiotics in intellectual circles — which does not necessarily apply amongst all sign theorists. Foucault turns the semiotic project into a story of conflict as society transitions abruptly from one semiotic condition to another. 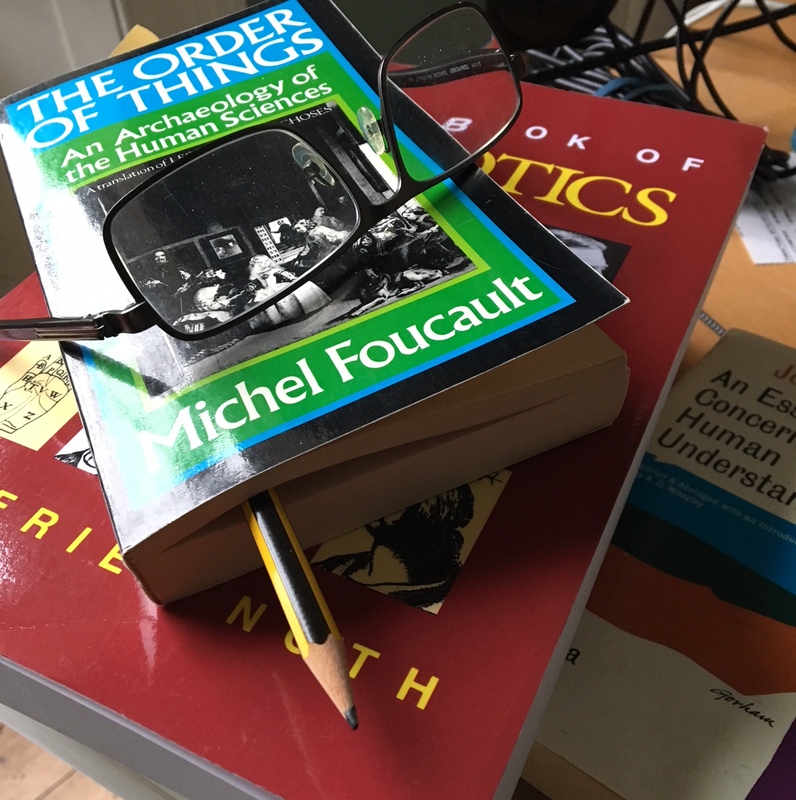 Foucault’s account is controversial, and in its day provided a new and challenging method for delivering a historical account — with its emphasis on signs. “Their difficulty arises because they are implicitly using a classical concept of reality in which an object has a definite single history. The whole point of quantum mechanics is that it has a different view of reality. In this view, an object has not just a single history but all possible histories. In most cases, the probability of having a particular history will cancel out with the probability of having a very slightly different history; but in certain cases, the probabilities of neighbouring histories reinforce each other. It is one of these reinforced histories that we observe as the history of the object. In the case of Schrodinger’s cat, there are two histories that are reinforced. In one the cat is shot, while in the other it remains alive. In quantum theory both possibilities can exist together. But some philosophers get themselves tied in knots because they implicitly assume that the cat can have only one history” (39). Foucault, Michel (1973). The Order of Things: An Archaeology of the Human Sciences, tans. R.D. Laing, New York: Vintage Books. Hawking, Stephen (1993). A Brief History of Time: From the Big Bang to Black Holes. Toronto: Bantam. Hawking, Stephen (1993). Black Holes and Baby Universes, and Other Essays. Toronto: Bantam. Locke, John (1976). An Essay Concerning Human Understanding, London: Fontana. Plato (1997). Cratylus in Plato: Complete Works, Ed. John M. Cooper, Indianapolis: Hackett, 101-156. By deploying discourse throughout a calendar, and by giving a date to each of its elements, one does not obtain a definitive hierarchy of precessions and originalities; this hierarchy is never more than relative to the systems of discourse that it sets out to evaluate.